The famous battle for Stalingrad (Nowadays – Volgograd) was a successful Soviet campaign against the enemy troops on the motherland, and a decisive turn during the terror of World War II. Performed between the 17th of July, 1942 and the 2nd of February, 1943, it brought heavy losses, being the bloodiest offensive of the WWII, with 1 100 000 dead and wound Soviet soldiers, and 800 000 German, Romanian, Hungarian and Italian ones. Stalingrad was one of the industrial leaders of WWII, producing a considerable amount of the army supplies and heavy transport to ensure and maintain the Russian domain over the enemy forces. It also formed a path to the oil supplies, located in the heart of the Caucasus area. After performing the “Operation Blue” and a few successful campaigns upon July 28, 1942, Army Group South – an elite squadron led by the German Marshal Fedor Von Bock aimed his firepower to the lands of Stalingrad. Army Group South was divided into Army Group A and Army Group B, intended to conquer both Stalingrad and Caucasus. Russian army dived deep into the East. Later, in August, German forces cracked the city from South and East and North. The Red Army defense was prosperous, with little losses. On August 23, German smashed the northern suburbs of the city, performing a tactical air attack using their winged bombers. Cleaning up the paths, the Red Army made a significant resistance against the enemy. By the Mid-September, the German Army pushed back the Soviet fire, along the stripe of the Volga. The Red Army was in under a massive assault. Between November 19 and 23, the Red Army performed a successful tactical move – Operation Uranus, where they hit and cracked the most exposed defenses of the Germans, located on the hills nearby and led by the Nazi Allied countries. An unexpected move from the Russian Army. The two German armies fighting in the city were surrounded and heavily pitted by six Soviet armies. Friedrich Paulus – the one who led the German lines asked for help and supplies. German government denied, yelling to stand and fight. Later in December, Hitler ordered some elite German squads in front with Erich von Manstein to rescue the troops under fire from the city. Shortly, they denied the decree again. 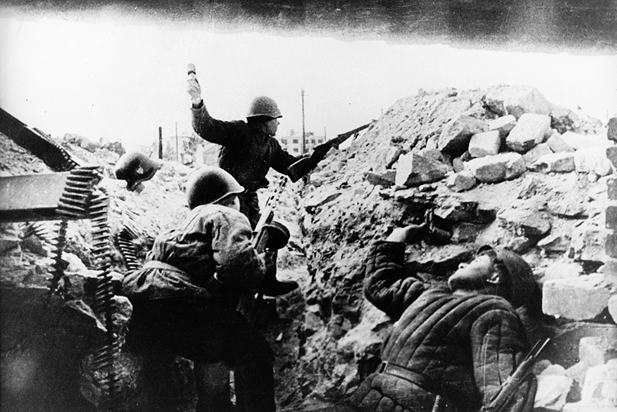 The final moves of the Stalingrad offensive began. Adolf Hitler refused to rescue the trapped soldiers from the city, ordering the general to fight until the end. On February 2, Friedrich Paulus and the remaining 91.000 soldiers surrendered. Stalingrad became the Hero City of the USSR. Enjoyed reading this article? Why not know some more impressive facts about the Funeral of Joseph Stalin.